Visit of Sri Lanka-India Cultural Association (SLICA) delegation to Jaffna on 4 April 2015. “Open House” meeting for Indian nationals at the Consulate on Sunday, 3 May 2015. Celebrations of the First International Day of Yoga on 21 June 2015 at Jaffna Hindu College. 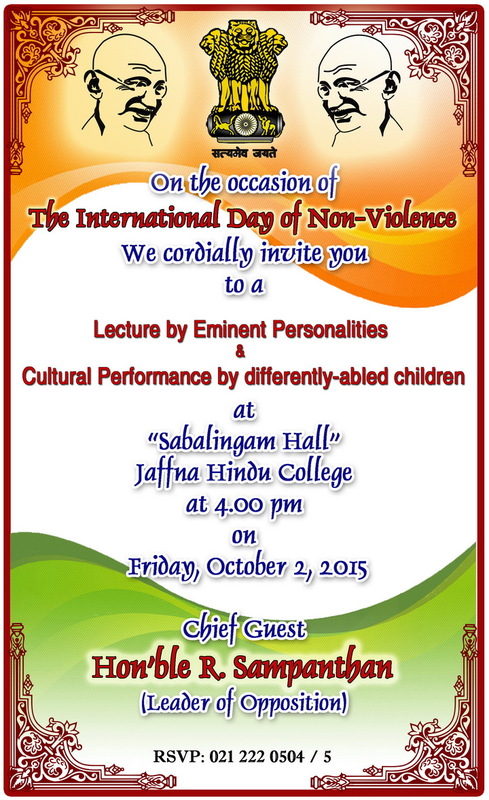 Celebrations of International Day of Non-Violence on Friday, 2 October 2015. Visit of the 44 member Indian Trade delegation of the Young Entrepreneurs School (YES) from Tamil Nadu to Jaffna. Classical evening on the occasion of celebrations of Deepawali at Nallai Aatheenam Mandapam. 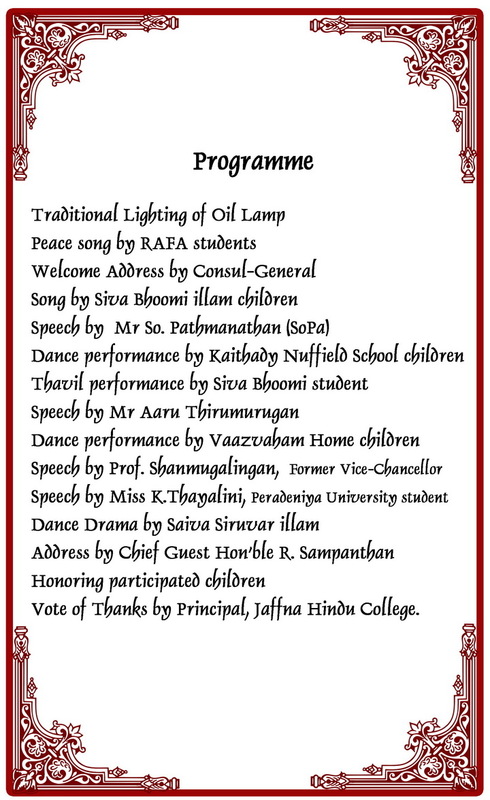 Cultural programme arranged by the Consulate General of India, Jaffna at Puthukkudiyiruppu Central College, Mullaitivu District. * Reception at Hotel Green Grass on the occasion of Republic Day of India. Visit of 60-Member of Trade delegation of TamilNadu Chmber of Commerce & Industries (TNCCI) to Jaffna. Celebrations of St. Antony's Church Annual Feast at Kachchativu Island. A Pattimandram (Debate) on the occasion of the 125th Birth Anniversary of the first Indian Law and Justice Minister Dr. B.R. Ambedkar held in Jaffna. Dedication of Duraiappah Stadium & the Celebrations of Second International Day of Yoga at Duraiappah Stadium. Celebrations of 155th Birth Anniversary of Nobel Laureate Gurudev Rabindranath Tagore at Jaffna at 9.30 am. Laying wreath at IPKF Memorial at Palaly, Jaffna by Consul-General Shri. A.Natarajan. Celebrations of 70th Independence Day of India at Jaffna. Celebrations of International Day of Non-Violence at 9.30 am at Thurkka Mani Mandapam, Nallur. Celebrations of 134th Birth Anniversary of Mahakavi Subramaniya Bharathiyar at Thurkka Mani Mandapam, Nallur. 0900 hrs - A Flag hoisting ceremony at India House on the occasion of the 68th Republic Day of India. 1900 hrs - Reception at Hotel Tilko on the occasion of the 68th Republic Day of India.